On the morning of April 30, a couple of Tontonme mudskippers at a tidal wetland of Sashiki-fusozaki in Nanjo. 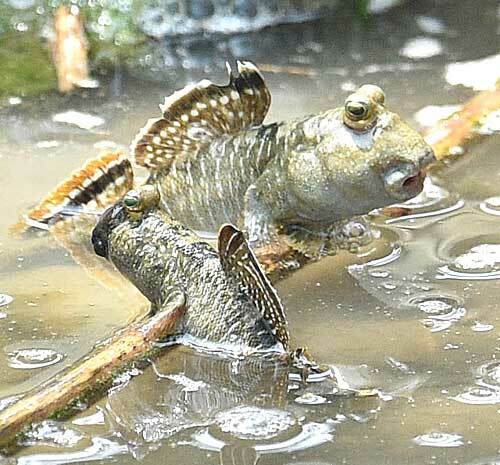 On April 30, at a tidal wetland of Sashiki-fusozaki in Nanjo, Tontonme mudskippers’ breeding season started, and courtship behavior was observed. Male mudskippers were demonstrating their beautiful back fins to attract the attention of females. Male mudskippers were also threatening each other. According to Katsunori Tachihara, an associate professor at the University of the Ryukyus, mudskippers are found throughout the Ryukyu Islands. Their breeding season is from spring to early summer. The Okinawa Meteorological Observatory has announced that there is going to be high atmospheric pressure in Okinawa over the next week or so. However, due to a pressure trough and moist airflow, it is going to be cloudy and rainy at some places later in the week. Black-faced Spoonbills enjoy sunbathing at Tomigusuku.